This report compares evaluation data on the Fuji FCR XG1, the Konica Minolta Regius 170, the Kodak DirectView CR500 and the Agfa CR 25.0. 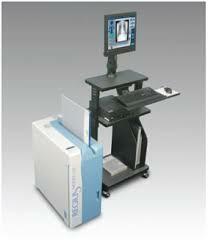 All four CR systems were clinically and technically acceptable in terms of image quality, ease of use and performance. Each reader uses a different method for cassette and image plate handling. But if either the Kodak or Agfa cassettes are inserted into the reader the wrong way round, the mechanism could potentially damage the cassette. The Konica has a significantly higher throughput as it can handle more than one cassette at a time. All systems had good post-processing functions, although the Kodak and Konica Minolta systems did not allow free text to be added at the review workstation (Konica Minolta has now added this feature in CS2 and CS3 software). And the modulation transfer functions of all the systems were similar. Although the Kodak is a desk-top unit, it has the largest footprint. The Fuji is the most space efficient as the review workstation can be placed on top of the reader.